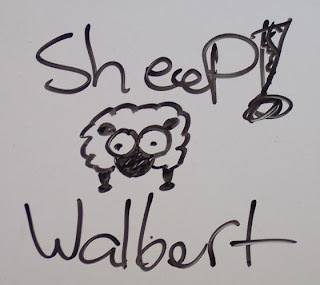 Well, apparently a new rule went into effect that says our painted-on whiteboards have to be rectangular. So, mine was started today and it's a just boring old rectangle. Here's a couple of photos. Two coats have been painted and the guy will be back on Wednesday to paint two more coats. 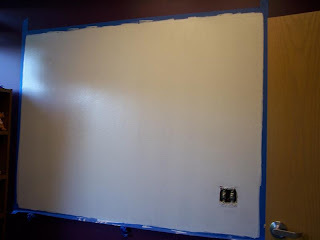 I need to bring in my leftover purple paint so he can make some touch-ups to the edges because he said the whiteboard paint tends to bleed quite a bit. I won't be able to use it until Friday. I may try to figure out a way to tape on additional materials to make it look castle-like. I'll have to think on it and try out some things when it's all dry and ready to use. 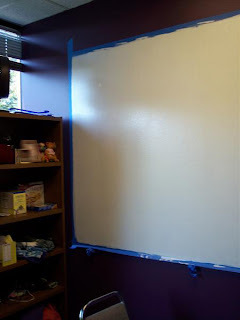 The whiteboard from my old office was sitting around waiting to be put up and now that I have a bigger, painted on whiteboard, I won't be using the old one. So, I took some photos of the Punkin's irreplaceable artwork that has been on it. Along with the other work-related stuff that I may actually need in the future.